I thought VM's was made of emeralds? Yes...Ducky's tiara was made up of emeralds, part of her dowry that she took back when she became Victoria Feodorovna, Grand Duchess Cyril of Russia. It is def. the same piece - I do not believe that one sister in law copied the tiara from the other. perhaps the stones were replaced in later years as these are apparently aquamarines. Maybe you have even mixed up the pieces or the information you read is simply wrong? she must have had it before her marriage - perhaps it was a wedding gift? No I am sure it is not. Look at John Van Der Kiste's book and you will see Ducky wearing the tiara with her other emeralds. Thestone was dark (emerald) and not light (aquramarine)I think the tiara was listed as one of the wedding gifts. The proof that was that Ducky continue to wear the tiara after she went to Russia. Aquramarines were the favourite stones of the Hesse sisters, not exactly a favoutite Ducky or Missy. Both Irene and Alicky had aquramarine bootches. The information on the tiara being Ella's was from when the piece was auctioned off several years ago. It was apparently her aquamarine tiara that she gave to Ernie who in turn left it, presumably to Don, and it eventually ended up with Dorothea (?) of Hesse. That's all I can remember about the info as I posted it a long while ago. I remember that sale and the parures details in the sale catalogue. I think it is more likely Ella's than Ducky's. Ducky had a spectacular collection of jewels and got to wear Alice's tiara. Don't think it was hers. Anyway by the time Ellareturn the jewels, Ernie and Ducky were already divorced. I haven't seen Ona wore that piece either,,,,? The aquamarine and diamond parure described above was given to her brother the Grand Duke Ernst Ludwig of Hesse-Darmstadt. Subsequently the parure was inherited by the Grand Duke’s younger son Prince Ludwig of Hesse, thereafter it was given to his first cousin twice removed Her Highness Princess Dorothea of Hesse, on the occasion of her wedding on the 1st April 1959. Subsequently the parure was inherited by the Grand Duke's younger son Prince Ludwig of Hesse, thereafter it was given to his first cousin twice removed Her Highness Princess Dorothea of Hesse, on the occasion of her wedding on the 1st April 1959. I am not surprised. It seems that all the Hesse girls like aquamarines. The article says that the pieces were made by Holmström between 1896 and 1903. The date cannot be true as Grand Duchess Victoria Melita is wearing the tiara in her wedding photograph which was taken in April 1894. Also: have we ever seen a photograph of Grand Duchess Elisaweta Feodorovna wearing part of the parure? I have not. There are - on the other hand - at least three (!) 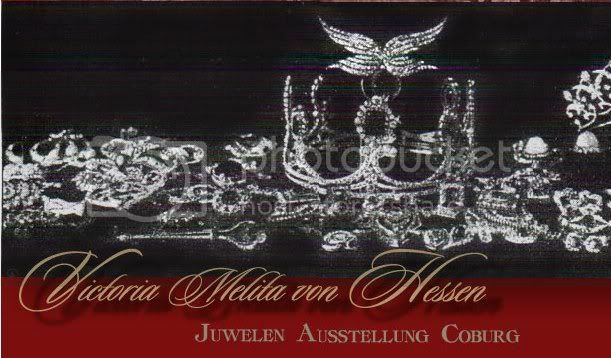 images of Victoria Melita with the tiara on her head. Taken between 1894 and 1905. This proves - to me - that it belonged to the Hessian Grand Duchess. In some cases even members of Royal Houses seem not to know the provenance of their precious belongings: the incredible "Fabergé vs Cartier" exhibition in Munich (2004 I think) included the wonderful diamond-necklace which was made for GD Elisaweta Feodorovna on occasion of her engagement (to be seen in numerous photographs of hers). The catalog did not mention either the Grand Duchess nor her niece Maria Pavlovna the younger to whom she passed it on in 1906 (photos of MP with the necklace have been posted on that forum as well!). It just mentioned the present owner, a member of the Swedish Royal House and supposed (!) that it was originally a present by the Dowager Empress Maria Feodorovna. I haven't seen any photos of EF wearing aquamarines but she is described several times, including a description by Queen Marie of Romania in her autobiography, as having done so. Couldn't this be that set? Once I again I have to insit, Ducky never wore that tiara. She owned one that is similar in EMERALDS ! She wore the tiara at her wedding and later as Grand Duchess Victoria Feodorovna. Grand Duchess Eleanore never wore that piece (unlike the Alice wedding tiara in which they both wore in photos). Thank you ! I think one could see the difference. If anyone had the copy of the ILN (The Hesse Wedding Special). You can see the wedding jewels illustrated here (liked the winged tiara).